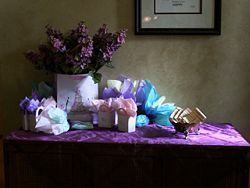 A table with wrapped gifts. A gift or present is the transfer of money, property, and so forth without the need for compensation that is involved in trade. A gift is a voluntary act which does not require anything in return. Even though it may possibly involve a social expectation of reciprocity, or a return in the form of prestige or power, a gift is meant to be free. In many human societies, the act of mutually exchanging gifts may contribute to social cohesion. Economists have elaborated the economics of gift-giving into the notion of a gift economy. Gifts are generally gratuitous and contrasted with the strictures of a contract involved in the sale or trade of property. 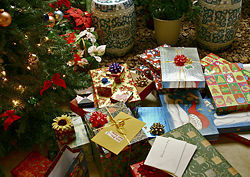 Yet, gift giving also has legal as well as social conventions and requirements. Human beings are social beings, and the acts of giving and receiving items are an essential aspect of human society. Even though there may be no expressed requirement on the part of the recipient of a gift, the social activity of gift exchange has been fundamental to most human cultures in history. A prosperous society in which all members can achieve happiness must include harmonious relationships which involve the giving of gifts. The word gift most commonly refers to "the action of giving, an instance of the same; a giving, bestowal." It is given voluntarily, without any specific obligation on the part of the recipient. In contemporary times, gifts are often thought of as tangible goods that are either purchased for the sole purpose of being given as a gift, or goods that are created for the express purpose of gift exchange, such as the armbands and necklaces in the Trobriand Islanders' Kula exchange. A gift can refer to anything that makes the other more happy or less sad, especially as a favor, including forgiveness, and kindness (even when the other is not kind). A gift can also be a special talent or ability that was not earned through the usual amount of long and difficult practice but instead comes easily to the recipient in a natural way. A person with such a gift is said to be "a natural" or "gifted" in that field of endeavor. A gift, in this sense, can be thought of as being given by God or by nature: a God-given or natural gift received by one at birth. 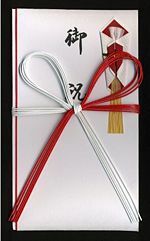 An envelope used in Japan for presenting a monetary gift. When material objects are given as gifts, in many cultures they are traditionally packaged in some manner. For example, in Western culture, gifts are often wrapped in wrapping paper and accompanied by a gift note which may note the occasion, the giftee's name, and the giver's name. In Chinese culture, red wrapping connotes luck. Gift giving occurs in many different situations. Many occasions are simply spontaneous expressions of feelings, others are in response to specific occurrences, and the final category consists of customs in different situations, which vary by culture. People use gifts to share wealth, offset the misfortune of their loved ones or others, or to give souvenirs of one's travels. Gift giving as an expression can be a symbol of love or friendship, a sign of gratitude for a gift previously received, alms or charity as an expression of piety or religiosity, or finally as an expression of social solidarity taking the form of mutual aid. Gifts under a Christmas tree. Lagniappe (a small gift given to a customer by a merchant at the time of a purchase, or more broadly something given or obtained gratuitously or by way of good measure; a bonus). an alternative gift such as a donation to a charity in the name of the recipient. a regift of an unwanted gift previously received by the giver. 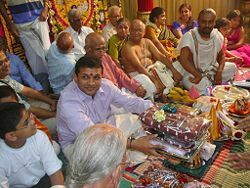 Gift giving during a South Indian wedding. Gift giving customs vary by culture and situation. Many countries have strong traditions of gift giving. 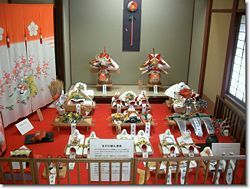 In Asia, it is polite to give and accept gifts with either the right or both hands, particularly in Japan and Hong Kong. In some countries, such as China, it is common to refuse gifts one or more times before relenting and accepting the gift. This is a sign of humility and is understood as polite behavior. It is important to understand cultural sensitivities when giving gifts, as some items are taboo in other cultures. Muslims do not ingest alcohol or pork and Jewish people do not eat pork. Giving of these items is considered an insult. In other cultures different colors, numbers, or items are associated with death, isolation, or other negative concepts and are therefore considered rude if given as gifts. As a rule, gifts across international cultures should not originate from the recipient's country (one should not give a gift of leather to someone from South America as their region is generally regarded as the producer of the finest leather). Ritual sacrifices can be seen as return gifts to a deity. Sacrifice can also be seen as a gift from a deity: Lewis Hyde remarks in his book The Gift that Christianity considers the Incarnation and subsequent death of Jesus to be a "gift" to humankind, and that the Jakata contains a tale of the Buddha in his incarnation as the Wise Hare giving the ultimate alms by offering himself up as a meal for Sakka. A gift in the law of property has a very specific meaning. In order for a gift to be legally effective, the grantor (or donor) must have intended to give the gift to the grantee. The gift must actually be delivered to and accepted by the grantee. Gifts can be inter vivos - during the life of the grantor - or causa mortis - made by the grantor in anticipation of their own death. A gift causa mortis (or donatio mortis causa) is not effective unless the grantor actually dies of the impending peril that he or she had contemplated when giving the gift. The grantor of the gift must have a present intent to make a gift of the property to the grantee. A promise to make a gift in the future is unenforceable, and legally meaningless, even if the promise is accompanied by a present transfer of the physical property in question. Suppose, for example, that a man gives a woman a ring and tells her that it is for her next birthday and to hold on to it until then. The man has not made a gift, and could legally demand the ring back on any day before the woman's birthday. In contrast, suppose a man gives a woman a deed and tells her it will be in her best interest if the deed stays in his safety deposit box. The man has made a gift and would be unable to successfully reclaim it. The gift must be delivered to the grantee. If the gift is of a type that cannot be delivered in the conventional sense - a house, or a bank account - the delivery can be effected by a constructive delivery, wherein a tangible item allowing access to the gift - a deed or key to the house, a passbook for the bank account - is delivered instead. Symbolic delivery is also sometimes permissible where manual delivery is impractical, such as the delivery of a key that does not actually open anything, but is intended to symbolize the transfer of ownership. Certain forms of property must be transferred following particular formalities described by statute law. For example, in the United Kingdom, real property must be transferred by a written deed (s. 52 Law of Property Act 1925). The transfer of equitable interests must be performed in writing by the owner or their agent. The grantee (or donee) must accept the gift. However, because people generally accept gifts, acceptance will be presumed, so long as the grantee does not expressly reject the gift. A rejection of the gift destroys the gift, so that a grantee can not revive a once-rejected gift by later accepting it. In order for such an acceptance to be effective, the grantor would have to extend the offer of the gift again. A donor may revoke a future gift; however a gift delivered and accepted cannot be revoked. A gift economy is an economic system in which goods and services are given without any explicit agreement for immediate or future quid pro quo. Typically, a gift economy occurs in a culture or subculture that emphasizes social or intangible rewards for generosity: karma, honor, loyalty, or other forms of gratitude. In some cases, simultaneous or recurring giving serves to circulate and redistribute valuables within a community. This can be considered a form of reciprocal altruism. Sometimes there is an implicit expectation of the return of comparable goods or services, political support, or the gift being later passed on to a third party. This would constitute a gift exchange. However, in what is considered to be in the true spirit of gift economics, many times giving is done without any expectation of reciprocity. The opposite of "Indian giver" would be something like "white man keeper" … [W]hatever we have been given is supposed to be given away not kept. Or, if it is kept, something of similar value should move in its stead … [T]he gift may be given back to its original donor, but this is not essential. The only essential is this: the gift must always move. A traditional gift economy is based on "the obligation to give, the obligation to accept, and the obligation to reciprocate," and that it is "at once economic, juridical, moral, aesthetic, religious, and mythological." While it is easy to romanticize a gift economy, humans do not always wish to be enmeshed in a web of obligation. Marcel Mauss wrote, "The gift not yet repaid debases the man who accepts it," a lesson certainly not lost on the young person seeking independence who decides not to accept more money or gifts from his or her parents. And as Hyde writes, "There are times when we want to be aliens and strangers." We like to be able to go to the corner store, buy a can of soup, and not have to let the store clerk into our affairs or vice versa. We like to travel on an airplane without worrying about whether we would personally get along with the pilot. A gift creates a "feeling bond." Commodity exchange does not. Hyde argued, somewhat against Mauss, that there is a difference between a "true" gift given out of gratitude and a "false" gift given only out of obligation. The "true" gift binds us in a way beyond any commodity transaction, but "we cannot really become bound to those who give us false gifts." Marshall Sahlins writes that Stone Age gift economies were, by their nature as gift economies, economies of abundance, not scarcity, despite their typical status of objective poverty. The origin of gift economies may be located in the sharing of food. 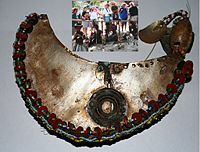 For example, the Trobriand Islanders refer to a gift in the Kula exchange as "some food we could not eat," when it is not food at all, but an armband or shell necklace made for the explicit purpose of passing as a gift. The potlatch also originated as a "big feed." Hyde argues that this led to a notion in many societies of the gift as something that must "perish." However, as in the example of the Trobriand armbands and necklaces, this "perishing" may consist not of consumption as such, but of the gift moving on. In other societies, it is a matter of giving some other gift, either directly in return or to another party. To keep the gift and not give another in exchange, though, is reprehensible. "In folk tales," Hyde remarks, "the person who tries to hold onto a gift usually dies." This notion of expanding the circle can also be seen in societies where hunters give animals to priests, who sacrifice a portion to a deity (who, in turn, is expected to provide an abundant hunt). The hunters do not directly sacrifice to the deity themselves. 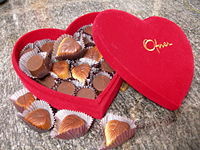 ↑ Kimberley Roberts, "Kim's Classy Business Tips Newsletter" International Gift Giving Cybor Link. Retrieved November 4, 2007. ↑ Susan Kurth Clot deBroissia. "International Gift Giving Protocol." "International Gift Giving" Netique. Retrieved November 4, 2007. ↑ Hyde (1983) 4, emphasis in the original. ↑ Marshall Sahlins cited at Hyde, 22. Marion, Jean-Luc (translated by Jeffrey L. Kosky). 2002. Being Given: Toward a Phenomonology of Givenness. Stanford University Press. This page was last modified on 2 April 2008, at 07:41.